Newspapers “Golos Ukrainy” and “Uriadovy Courier” and channel “Pershiy natsіonalny”, which work on account of the taxpayers’ money, illuminate the news about displaced persons from the ATO area. However, it does not provide useful information for internally displaced persons themselves. 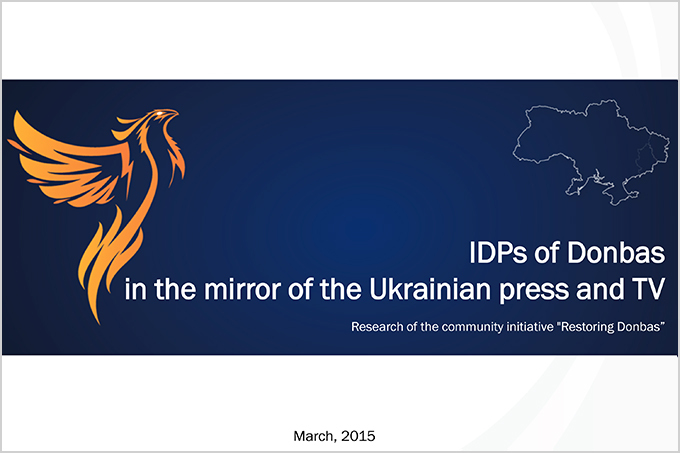 Such conclusions were made by experts of the community initiative “Restoring Donbas” based on monitoring of February Ukrainian print media and television materials. In particular, in February the daily newspaper “Golos Ukrainy” wrote about the complexities of the official registration and employment of displaced persons, preparation before the settlement of modular towns, activity of the Red Cross in the Donbas, etc. At the same time, in such materials there were no contact information or clarifications about operating procedures for displaced persons. Furthermore, the state media almost did not illuminate the possibility of obtaining the state aid by displaced persons (for instance, the terms for registration of targeted assistance). 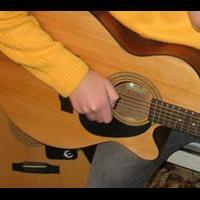 Also, the possibility of obtaining aid within the international programs is not explained. Thus, in February, there were no materials about valid UN grant program for business development and reconstruction of accommodation in state media. There were no reports about terms or cases of obtaining such grants by Donbas displaced persons. The content of state media is full of imbalances towards the news stories and politician’s statements with the damage of reference and clarifying information. At the same time, according to experts from Donetsk and Lugansk regions, who were surveyed by “Restoring Donbas” in December 2014 – January 2015, displaced persons from ATO area, first of all, need legal consultancy, provision of reference materials and psychological counseling. According to survey results, commercial media is characterized by the lack of useful content for displaced persons. 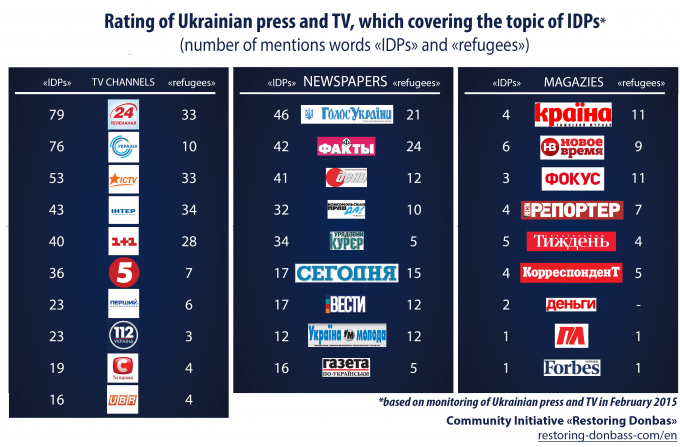 In general, according to the monitoring results, Ukrainian newspapers, magazines and TV channels mainly illuminate the news related to displaced persons. During the month, there were 807 published materials with the words “displaced persons «and 409 materials with the word “refugees” in the media, which were surveyed. Most of these materials are TV broadcasts (476 and 195 references respectively). On the second place there are newspapers (311 and 165), the third – magazines (30 and 49 respectively). “Golos Ukrainy”, “Fakti i kommentarii”, “Den’”, “Komsomolskaya Pravda in Ukraine” and “Uriadovy Courier” – are the top 5 newspapers on the subject of displaced persons. “Vesti” and “Segodnya” also wrote about displaced persons. Among the magazines, which are leaders on materials about displaced persons in February, became the “Krajina”, “Novoe Vremya” and “Focus”. Also, the issue of displaced persons is popular themes in the “Vesti Reporter”, “Ukrainian Tyzhden” and “Correspondent”. “24 channel”, “Ukraine” and “ICTV” are the top 3 channels on the issue of displaced persons. “Inter” and “1 + 1” are slightly behind them. The reportage format for submissions about displaced persons is the most famous among the Ukrainian TV channels. More information about the monitoring results – in “Our projects”.